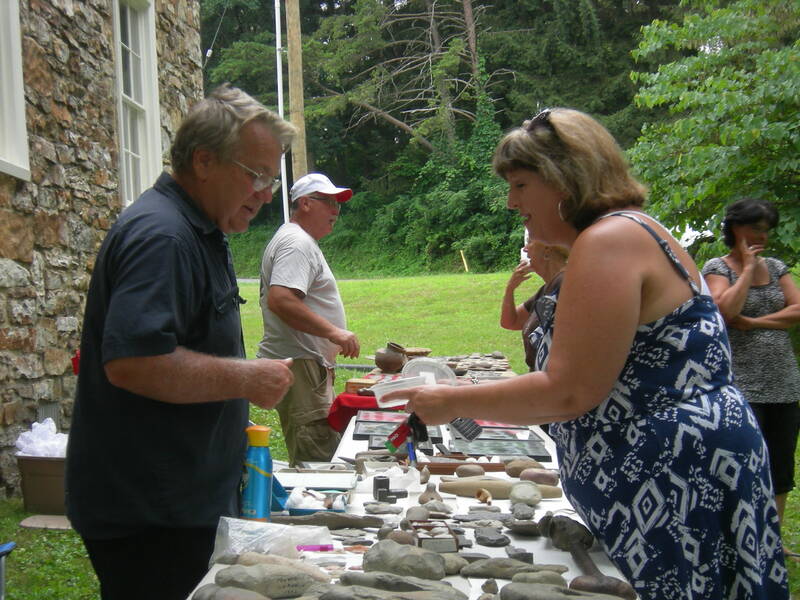 Sunday, July 13, 2014 there were a lot of gnats at the Tuscarora Academy Museum, but that didn’t stop the 60 visitors who came to see the collections of American Indian artifact collectors Andy Paige, Dennis Zeiders and Steve Zeiders. The Zeiders men have been hunting artifacts since the 1960s and have a vast amount of quite interesting items in their displays, many hard-to-find ones too. Paige, who began hunting artifacts more recently, also includes unusual pieces in his collection. 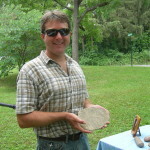 His latest find was a bake oven used by the American Indian which he holds in the photo above. The piece was heated then the dough was placed onto the rock and baked into warm, tasty bread. Steve Zeiders identifies an artifact brought to the event by a local. Zeiders is an avid hunter and collector, a hobby he’s been doing since a teenager. Dennis Zeiders [right] shows off some of his pottery and a plow to visitors at the Tuscarora Academy. 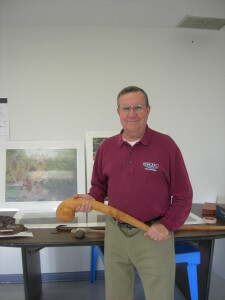 He, his cousin Steve and Andy all have different items which makes a full-rounded display of items that describes how the American Indians lived and maintained their way of life. The Tuscarora Academy, open every Sunday through the end of August from 1:30 to 4:00 p.m, will host a Civil War Reenactors’ encampment the weekend of August 15, 16 and 17. That weekend, the museum will be open Saturday, from 1:30 to 4:00 p.m. Hope to see everyone there! Introducing “Today’s DAR,” the application process, and working individually with those who wish to explore membership in the Daughters of the American Revolution. Deborah White Hershey, current Pennsylvania State Chairman for Lineage Research, National Vice Chairman’s Association 2nd Vice President; Central Pennsylvania Regents’ Club Secretary Past National Vice Chairman, Eastern Division for Historic Preservation, South Central District Director of Pennsylvania State Society DAR and proud member of the centennial Harrisburg (PA) Chapter, NSDAR. As a 34 year member of NSDAR, I have held numerous positions within my Chapter, State and National organization. The Harrisburg Chapter Historic Preservation Committee, of which I am a member, recently published a book entitled “Revolutionary War Patriot Historic Houses of Dauphin County, Pennsylvania” and I published a family history on the Shoemaker, Packard and Avery families. 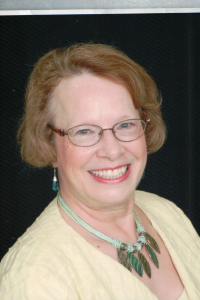 I own my own genealogy company and work diligently on NSDAR, SAR, CAR, SR, First Families of Pennsylvania, Daughters of the American Colonist, and Sons of the American Colonist papers, as well as other lineage society applications. The society recently added something new to their walls at the Archives — two clocks! Those of you who haven’t visited the society’s Archives for some time should stop by and see what’s hanging out there. The clocks that were just placed on the walls last week are a rare Waterbury “Leipsic” model walnut parlor/regulator clock circa 1895-1915. This clock once hung in the Keystone Hotel in Mifflin, PA and actually survived the fire that took place in that Hotel in March, 1968. 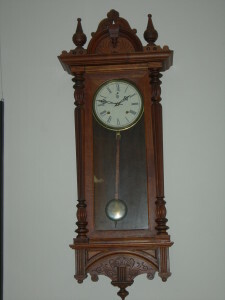 The other clock once was in the Port Royal Times building that was located on Fourth Street, Port Royal and was a gift from a society member. Both of these pieces make a nice addition to the Archives for visitors to see as they work on research projects. 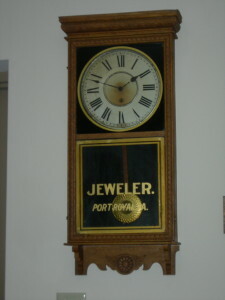 Come visit and check the time on one of the clocks on the wall. You could also take a minute to do some research on local history or your own family members while you’re there. The Archives is open Tuesdays and Wednesdays from 9:00 a.m. to 3:00 p.m. or call 717-436-5174 to make special arrangements, or for directions or more information. For those of you who are doing any genealogy on the families of Hench, Hartman or Rice, the society recently received the publication Genealogy of the Hench & Hartman Families, compiled by Steve Runkle and his wife Janeann, February 2012. Runkle, who recently gave two presentations to area residents concerning the Revolutionary War, provided the society with a copy of the publication which tells about those families, who played parts in the war. Many of the ancestors of these families are local residents. This book is available for research at the society’s Archives Room that is open Tuesdays and Wednesdays from 9:00 a.m. to 3:00 p.m.
Want to research your family members who were part of Juniata County at one time? There is one complete section at the Archives Room that holds various compiled family histories. If interested in becoming a member of the society, they are available for as little as $15 per year. Call the society at 717-436-5152 between the hours listed above for more information. 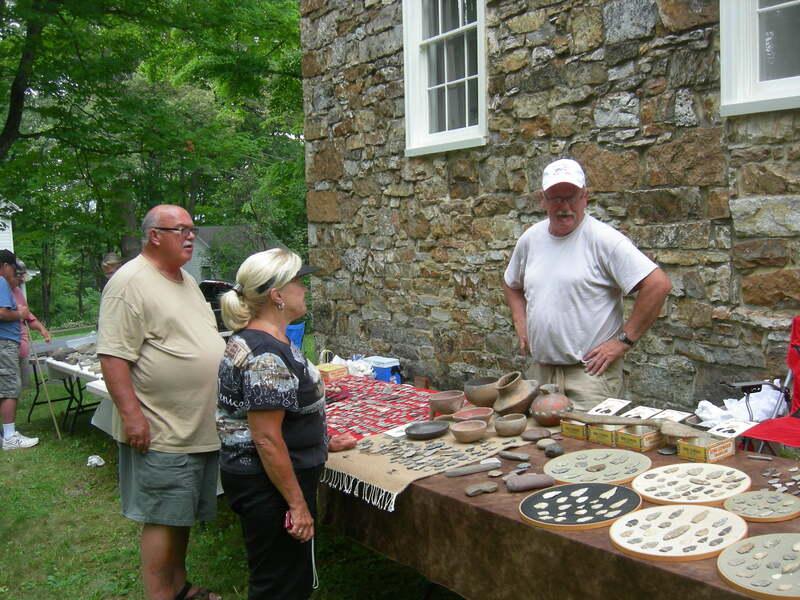 Or, just stop by to learn more about Juniata County Historical Society. We’re located directly below the Juniata County Library at 498 Jefferson Street, Suite B, Mifflintown.